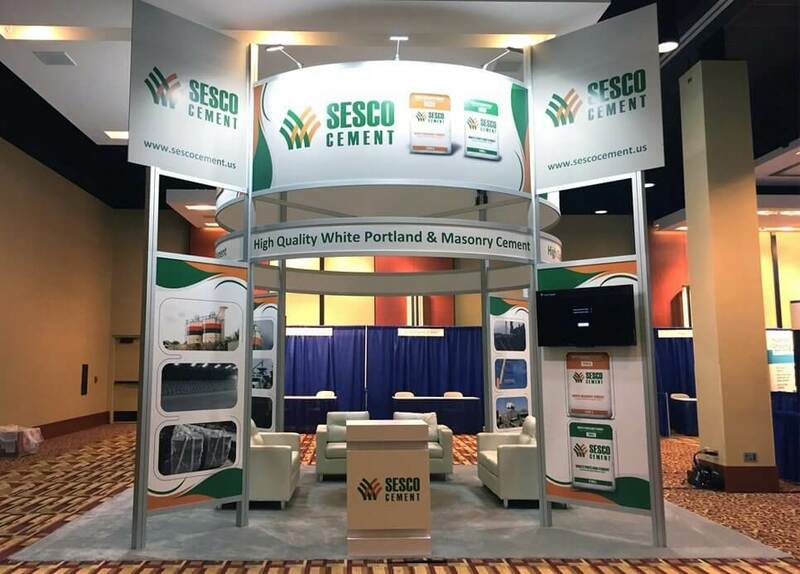 Sesco Cement was a platinum sponsor at the INTERCEM Americas 2016 Conference and Exposition in Houston TX. INTERCEM is the number one conference for senior executives to become well-informed of what’s happening in the cement world. More than 30,000 delegates from over 120 countries have attended events in over 80 locations, making it the most successful international cement industry event. Fortunately, Exhibit Network has a large modular exhibit inventory and was able to configure a solution that effectively pulled together the properties necessary to create a 16’ x 20’ island booth and a 7 x 19 inline. Sesco Cement provided its own graphic artwork with the specs provided by Exhibit Network. Sesco’s second challenge was a three-hour time frame for installation. To overcome this challenge, Exhibit Network set up the booths in our warehouse before shipping to showsite. This was to ensure all the pieces – the structure and the graphics – fit together perfectly. Second, two hours were gained by Exhibit Network requesting approval from the show producer, show decorator, and hotel event manager for an early move-in. Sesco’s third challenge of maximizing value for a one-time use was solved by taking advantage of Exhibit Network’s rental program. Sesco was able to make a big impact at this event without the expense of purchasing new exhibit properties. And for the graphics? To get the most value for money spent, Sesco plans to display their new graphics in and around their facility.